Coleraine manager Oran Kearney. Photo by TONY HENDRON/Presseye.com. Coleraine manager Oran Kearney is hoping to have plenty to cheer about this Christmas after a difficult month. The Bannsiders came into December on the back of a long unbeaten run. But four defeats in a row have been hard for them to take. In truth though they have been unfortunate not to take somethi ng out of those games. “It has been a tough month in many ways, but we’ve been unfortunate in those games not to come away with something from them,” said Kearney. “I know people will look at four defeats on the bounce, but I didn’t pay too much attention to our unbeaten run and I won’t be paying too much attention to our run now. Tuesday night’s League Cup semi final defeat against Ards was a hard one for him to take. “It was probably the darkest I’ve felt in all my days in football,” admitted Kearney. “I was really low on Wednesday and Thursday. The players were too, everyone was gutted by the result. “We spoke frankly about what happened before Friday night’s game. “But you can go two ways after a result like this. You can either get dragged down further by it or you learn from it and bounce back. “We didn’t strangle the game against Ards as we have down in previous games this season, we have to make sure we do that from now on. “We have so much to play for, I want us to have a real pop at the Irish Cup and kick on in the league again. 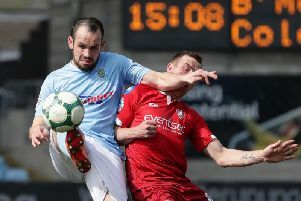 Kearney is hopeful to have both Howard Beverland and Michael Doherty available again after they missed Friday’s game due to injury.